What are trail bollards? Those posts that are deliberately placed on trails for your safety. Their original purpose was to keep cars off the trail. In theory, that would make conditions safer for trail users. But this treatment has been backfiring around the country. The post in the middle of the trail method has resulted in serious user crashes on trails. We've had two such crashes on my local trail, the Richland B&O Trail, that have resulted in fatalities. I lost a good friend in one of those tragedies. It prompted me to research and study the matter regarding why bollards are used, why trail users are crashing into them, and why we deliberately place a structure on a trail that we know is a hazard. In this and upcoming posts, I'll visit various aspects of the bollard hazard issue to help educate and inform trail users. Let's get started. Trail Bollards Are Clearly Visible: What's The Problem? "Those posts are clearly visible. Why don't cyclists open their eyes and pay better attention when trail riding?" This is a common perspective held by many people. They have not had a bollard crash or close call, so they have no understanding as to how they occur. It's also likely that they haven't had a friend or loved one suffer such a crash, so they've never really given the subject much thought. I've found two common scenarios where one can crash into a clearly visible trail bollard: The distraction and the failure to multi-task properly. But before we get to those, we need to identify the "safe zone." On my wide-handlebar mountain bike, I measured and found the zone to be 2' 10" wide on a typical bollard set on the B&O Trail. Again, this zone will vary, but the point is you need to be in the safe zone or you'll risk a handlebar strike or worse. Now let's get back to the cause scenarios. The failure to properly multi-task error can best be seen at a typical road crossing. As the rider approaches the road and bollards, she begins to multi-task by assessing crossing traffic while also monitoring the bollards to find her safe zone. She takes on both tasks because she has been taught to do so. Whether it's riding a bike, motorcycle or driving a car, we're taught to look directly in front of our vehicle, while anticipating what's happening further ahead at the same time. This is normal behavior, not reckless or stupid. If she fails to find the safe zone during her multi-tasking, she will risk a close call or crash. How could she fail at something that sounds so simple? Perhaps she's tired or dehydrated from a long ride. Maybe she's a novice rider that's still learning to hold her line. The possibilities are numerous. If she doesn't get it right -- for whatever reason -- she's at risk of a collision. Here's a video of what such a failure looks like. I was stopped on my bike at a trail stop sign, waiting to cross a rural highway that crosses the B&O Trail. I'd been having some trouble with my depth perception (yes, it's an age thing) and was attempting to be more vigilant at crossings. I started to cross, noting an approaching car in the far lane. I pushed off and continued to monitor the only car coming my way. It was at a safe distance, or so I thought. I quickly realized that the car was either traveling faster than I anticipated, or was closer than I first thought. So, I stomped on my pedals to stay safe and not aggravate the driver unnecessarily. Within one hard stroke (or two) I was picking up speed and entering the trail again on the opposite side of the road. Still fixated on the car, my head swung around after I entered the mouth of the trail. My speed still rising, I experienced a sudden start that caused my body to jump as my eyes confronted the bollards and I reflexively steered into the safe zone to avoid a collision. Initially, I did not understand what had happened. I knew the bollards had taken me by surprise, but I didn't know why. I'd passed by them hundreds of times and both my conscious and subconscious mind were well aware of their presence. How could I be surprised by something I knew was there? It didn't make sense. But when I thought back to the road crossing, things began to come clear. I was so focused on my depth perception issue, that I had momentarily forgotten about the bollards altogether. I (or the car, depending on your perspective) had managed to distract myself completely, putting me at risk with the immovable objects. I had ridden the trail for about 15 years or more and just experienced my first distraction that could have easily lead to a bollard crash. In fact, if the bollards had been at the mouth of the trail, rather than backset by a number of yards, you could have flipped a coin as to whether I'd have crashed. [Aside from the two scenarios above, the Federal Highway Administration also lists these 2 bollard crash causes, "...Poorly installed bollards can lead to head-on collisions. Bollards are involved in 'second user' crashes, where the first user hides the bollard until it is too late [for the 2nd user] to avoid it..."
Here's what I learned: You will not know the time, place or form such a distraction may take. Therefore, you cannot prepare for it. It may be a hornet flying inside your jersey collar at precisely the wrong moment. It may be a blaring car horn from a nearby road that causes you to turn your head without thinking. I hope you are fortunate and never have such an encounter, but make no mistake, no one is immune. But it didn't take this incident to make me realize that putting trail bollards in the middle of a bikeway is dangerous. I knew it the first day I laid eyes on them. The placement is an obvious hazard that cyclists, bladers and others have to try to avoid the dozens or hundreds of times they pass by them. For example, if you ride the entire length of the B&O Trail out and back, you will encounter 49 bollard sets. You'll have 98 chances to make a mistake that may result in a life altering or ending event... during one trail ride. If you and those dearest to you have been fortunate enough to avoid a bollard collision, I'm grateful that you have been spared. As for me, someone who has ridden bollard-laced trails for many years, I've seen the damage they can do. As I've mentioned, I've had a friend die from injuries he suffered as a result of a bollard crash. Another friend was riding with her brother who also died from bollard crash injuries. I rode upon the scene of another bollard crash that bloodied a young man's face, and of course I had my close call... all on the same trail. Once local media picked up on this topic after the most recent tragedy, more people came forward to tell their stories. It turns out that many bollard collisions go unreported and more folks I know have either witnessed a collision or had one themselves. Its difficult to determine how widespread these accidents are, but one thing is certain. If you ride on trails that use this antiquated bollard placement method, it's only a matter of time until it affects you too. Why are some bollards more dangerous than others? I'll take a closer look at that question in the next post. Why are some trail bollards more dangerous than others? To properly answer this question we need to look at three aspects: bollard placement (location), visibility and type. As already mentioned in Part 1, trail bollards placed in the center of a trail are an obvious hazard. But perimeter or trailside bollards also pose a threat. Many are close enough to the trail surface to allow a handlebar strike if a cyclist rides too close to the edge of the trail surface. Bladers may also find trouble with a poorly timed leg kick. And finally, riders who unintentionally drift off the trail surface (experienced riders can do this as well) are in for a shock should they drift into a trailside bollard. When bollards are used, you can typically find them at road crossings. The idea being to stop car encroachment at its point of origin. The problem that bollard-using trail builders soon realize is that cars can often enter a trail at many other points as well. Their answer to this potential problem? Use more bollards -- of course! As a result, they place them here and there, away from where trail users expect to see them, at road crossings. The B&O Trail has 8 such sets. At the time of this writing, 5 of those sets still have a center post. It was one such location that took the life of Guiseppe Maino in May. Another (pictured above) was the site of an accident in June that landed an 80-year-old rider in the hospital in serious condition. Trail users do not expect to encounter center poles at random locations along trails. Therefore bollards at these spots are more likely to cause accidents, particularly with users who are not familiar with the trail. For those who ride trails without bollards, no placement would necessarily be expected. Truth be told, it's virtually impossible to eliminate all vehicle access points on many trails. And that's not such a bad thing as many might imagine. After all, don't we expect rescue crews to reach trail users in an emergency? If so, consider that bollards slow their response time. The B&O Trail has a total of 49 bollard sets. Despite this, there are 24 vehicle entry points where a vehicle can drive onto the trail without encountering any barriers and access 59% of the trail. For those who count on bollards to keep them safe on the trail, this is a disaster. Or is it? When one considers that these access points have been around for 17 years with no harm to trail users (to my knowledge) from any motor vehicles one has to ask, "How effective are trail bollards? And are they doing more harm than good?" In the case of the B&O Trail, they are clearly doing more harm. When trail builders place bollards directly on a trail surface, they know they are creating a hazard for users. To attempt to minimize that hazard, they try to make them as visible as possible. There are many treatments used: striping, bright colors, reflective treatments, etc. Though this may prove helpful, it cannot eliminate the hazard altogether. As mentioned earlier, the "multi-task" and "distraction" scenarios can still lead to serious and fatal bollard accidents despite their visibility. Bollards come in different forms as well. The B&O uses the old steel version from 1995, when the trail was constructed. These posts are quite tall, wide and very robust. If you test them in a collision, you will surely lose. Shorter versions have been produced more recently that are smaller in height and diameter, but still unforgiving and solid. Flexible versions have also popped up in other parts of the country. You might think that cyclists are happy to see those. Well, not exactly. You see, these more-forgiving versions have a fixed base. This base is essentially a trip hazard. So if you collide with one of these, you can still suffer a serious accident, albeit a different type. So if your local trail swapped their rigid bollards for the more flexible type you might rightly wonder, "Did we just exchange one type of hazard for another?" "Isn't there a better solution?" Well, yes there is. But before we get to that, let's look at why trail builders place a known hazard on trails. That's coming up next. Trails can be expensive. Not when compared to roadways mind you, but that doesn't mean they are cheap to construct. It's been estimated that a mile of trail can cost anywhere from $330K to $1M to build. While the main focus may be trail construction, costs can be driven up by things like land acquisition and treatments such as fencing and yes, trail bollards. What does that have to do with bollard placement, you ask? Everything. Envision a long parking lot that abuts a bike trail where drivers can literally drive onto the trail surface. If your goal is to stop motor vehicle encroachment, you have two choices: cordon off the lot with parking blocks and heavy duty fencing, or, just put a set of bollards across the trail at the far ends of the lot. It's obvious which treatment is cheaper. I believe this explains the haphazard placement of at least 8 B&O Trail bollard sets. These are placed at random locations along the trail to try to address these vehicle access points, like the previous parking lot example. But attempting to cordon off a trail to all vehicle access is no small task. 24 vehicle access points remain on the B&O despite the use of 49 bollard sets. To close the "holes" one would have to add about 48 more sets! It's clearly an expensive undertaking, even when utilizing this less expensive barrier option. And most regrettably, this method is the most dangerous treatment for trail users. Aren't there better ways to approach this problem? Yes. And I'll get to that in my next post. But now let's get back to trail builders who use the trail bollard approach. As I've mentioned, this dangerous bollard placement is probably the most cost effective approach for those who wish to use these barriers. But why use this approach in the first place? Ah, now that's the real question, isn't it? Let's examine that now. I've followed bikeway infrastructure design in this country long enough to see a disturbing pattern. First, we come up with our own infrastructure concepts that we think will work on the road and trail. Next, we look to the "innovators" in the most progressive U.S. cities like Portland for the latest "cutting-edge" design advancements. Eventually, the rest of the country follows their lead. Eventually, is the key word here. The problem with this process is that it's largely a waste of time, money and now lives thanks to design treatments like the bollard hazard. Rather than starting with an obviously flawed concept -- like placing a known hazard on a bike trail -- why not look to other parts of the world where they've been building trails for far more decades than we have in this country? Why are we trying to reinvent the wheel? And once we get it wrong, we are not quick to make the proper fix. For example, the B&O bollards were installed in 1995. Earlier this year I visited the County Line Trail in Wayne County that also uses trail bollards. The trail was constructed in 2010, 15 years after the B&O. Yet, the only thing that has changed in that time is the size of the steel bollard. It's smaller. 15 years have passed and virtually no progress has been made regarding this hazard in Ohio. That's simply not acceptable. Next up, we'll look to better alternatives that do away with placing bollards on a trail. Thanks for taking the time for this lengthy but needed exposition of the issue! And to your point about following innovators and leaders like Portland, and Not reinventing the wheel, looking to Europe, I know for a fact that PDOT bicycle planners visited Europe in the late 1990s, and many times since, to examine "Best Practices" over there, and brought back the Colored bike/vehicle on street crossing painting. Now let's turn our attention to alternatives to the dreaded bollard treatment. 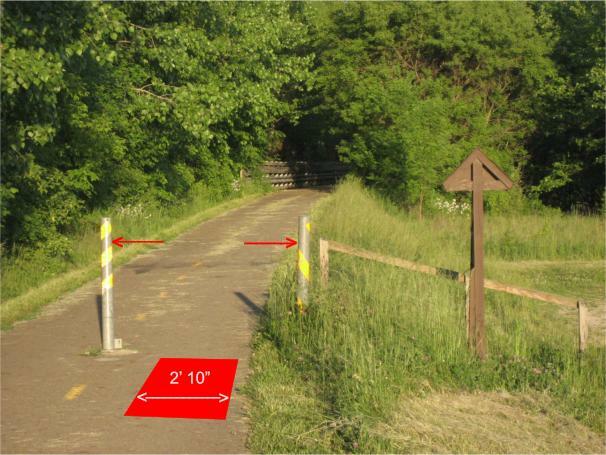 The following designs are intended to demonstrate how trail builders can discourage motor vehicle encroachment without endangering trail users. Since traditional asphalt trails can also resemble a paved one-lane road, inevitably some drivers will become confused and unwittingly drive onto a trail. 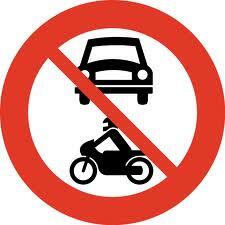 Particularly if the entrance has no signs clarifying that motorized vehicles are not permitted. The split trail method disguises the trail opening where it meets the road so that it no longer looks like a road, or perhaps even a trail! However, clever designs of this type do allow trail users and emergency vehicle access nonetheless. The example shown above splits the trail into 2 - 5' sections. Next it uses low height landscaping to fill the median that's created between sections. The median is low and narrow enough for emergency vehicles to straddle to enter the trail when necessary. Drivers mistakenly turning onto trails are likely the most common reason for encroachment. To help prevent drivers from making this mistake, proper signage can be used. 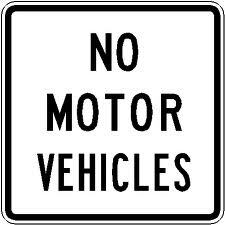 The 'No Motorized Vehicles' sign has been the old standby for this task. My only beef with this sign is that, though it provides the appropriate warning, it does little to draw attention to itself. It's a bit too generic. In these times where distracted driving is so commonplace, you're asking a warning sign with no pop or punch to get the job done. It will suffice for some, and I suspect fail with others who are more focused on figuring out where this strange one-lane road may lead. The bright orange of construction zone signs or red for wrong way signs do a much better job of getting our attention. The newer bright green signs as well. The brightly colored reflective strips attached to sign posts can add to the effect. The premis is basic: Grab their attention to prevent the "wrong-turn" mistake. If you've never been on a trail without bollards, you may not know that such trails do in fact exist! Let's look at one example. A minimalist approach to discouraging motor vehicles from entering trails can be found on the west coast. The concept uses visual cues to let drivers know cars are not permitted. The image above shows a high curb (with an offset curb cut for trail users) to discourage vehicles from entering the trail. 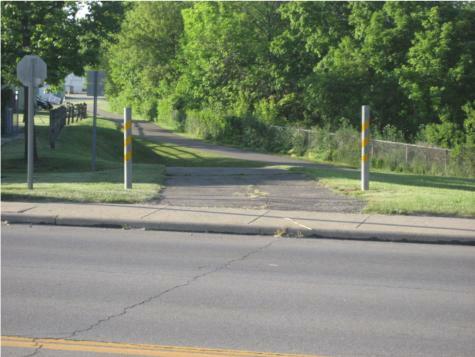 For those Ohio trail users who have become accustomed to bollards, this may hardly seem like a reasonable solution. After all, haven't bollards like those on the B&O Trail been keeping cars at bay? What's a measly curb going to accomplish? Take a look at this photo. This was taken in Lexington, Ohio. It's the former at-grade B&O Trail crossing on Main Street (Rt. 42). After an underpass of the busy 4-lane road was proposed for the bikeway, the curb cut on the north side of the street was never made. As a result, we have a trail entry point for vehicles that has no center bollard and no 'No Motor Vehicles' sign in place. The only thing preventing cars from entering the trail here is the high curb. This simple visual cue is doing the job of keeping cars out. With a slight modification of smaller curb cuts to allow bikes to enter and exit the trail, this visual cue can be left in place to continue to deter drivers. This demonstrates how this technique works right here in Ohio. 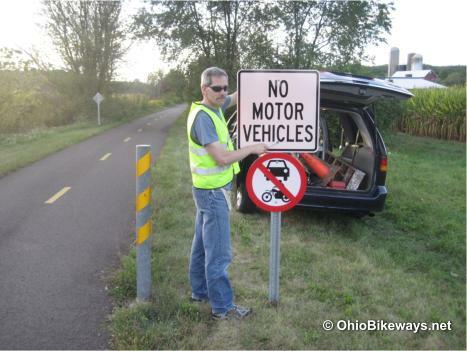 For trail builders that have become dependent on bollards or may be nervous about minimalist designs, 'No Motor Vehicle' signs can be added for an additional deterrent. But What About The "Crazies?" Trail bollards have been shown to be largely ineffective as many can be easily driven around. The bottom line: if someone is determined enough to drive onto a trail, they will, despite bollards, fencing or whatever barriers you care to erect for them. Unfortunately many have used the bollard presence as a sort of security blanket over the years. They have seen them diligently holding their positions, supposedly keeping vehicles off the trail. Well, if you were to take a superficial look at them, yes, you might think they're doing good. You may even believe that those dangerous little poles are preventing chaos from breaking out on the trail. But if you've read all my posts in this series, you are better informed and you now have more than a superficial understanding regarding this subject. But don't stop there, spread the word about this trail hazard! If you have these dangerous bollards on your trail, let the folks in your community know. If nothing else, refer them to this blog for further reading. I've really enjoyed the series of stories about bollards. I'm involved in building the Marion Tallgrass Trail, and this series has been very informative. I noticed on GOBA that the trail that we took into Chillicothe (from the west) had a set of bollards at an apparently random position, along a shaded area of the trail and not close to any intersections. That trail has few bollards, so it was a big surprise when we came upon them, and I easily could have hit them. Perhaps they were at a change of jurisdiction. Great job with this story, and I'm really hoping that some action will be taken with the bollards on the B&O Trail and elsewhere. Trails: A Waste of Money? How Well do Bike Boxes Work?